New!There is currently an introductory deal going on. Get your first month and a uniform for $25! Unlike many Karate schools, Sho Rei Shobu Kan doesn’t believe in long, extensive contracts. Students only pay month-to-month. 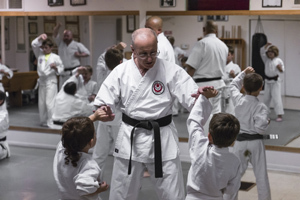 Many schools lock students into a time frame, promising something to the effect of “A student will become a black belt within 2 years.” A student is never promised a black belt here. We are a school that teaches in the old, traditional style of Okinawan Karate. If a student puts forth diligent effort over time, they will become stronger and more knowledgeable. Testings are only given 4 times per year, and we do not advance students more than one rank at a time. When you first sign up, you will be given a booklet that describes the curriculum and our ranking system. Council Bluffs Sho Rei Shobu Kan is strictly a Karate dojo. We offer child and adult classes throughout the week, and a joined class on Saturday mornings. Children can join Sho Rei Shobu Kan at age 5. Students are considered a youth from age 5-15. Youth classes are offered on Tuesday and Thursday nights from 6:30PM – 7:30PM, with a combined class on Saturday mornings from 10AM-11:15. Youth classes focus on building strength, determination, coordination and confidence for children. Students will focus on developing good form and solid techniques through ancient routines called Kata. In addition, they will learn self-defense techniques, as well as light sparring and throwing techniques. Adults are able to attend both youth and adult classes. Students are considered adults if they are over the age of 16. 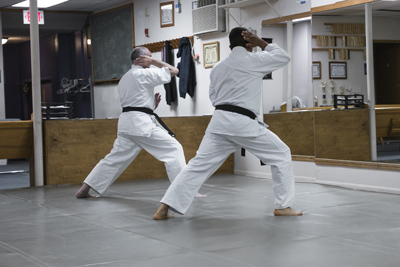 Students attending the adult classes can expect to study the kata in greater detail than is offered in the youth classes, delving deeper into the hidden meanings behind the movements. Adults also work on additional requirements for ranking not required of youth, such as additional kata, and other sparring drills and such. These additional details are studied in depth during these classes.